Origin and Habitat: Cape Province, Namaqualand, Richtersveld, South Africa. 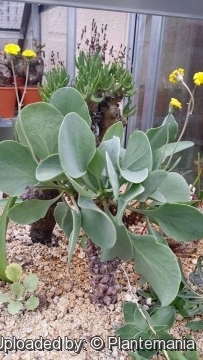 Othonna herrei is a rare plant that occurs mainly on the central mountain ranges of the Richtersveld (near Stinkfontein and Numies). It is a localized habitat specialist (Extent of occurrence 517 km²), known from four locations. Altitude range: Around 300 m.
Habitat and Ecology: Succulent Karoo. Othonna herrei is not generally plentiful at any locality and populations are widely and thinly scattered only on very rocky slopes in remote inaccessible areas. It grows mainly on the south- and south-east- facing slopes of rocky mountains almost always adjacent to, or partially under, large rocks and boulders, particularly where the substrate is quartz. Its preference for sheltered rocky crevices offers it some protection from the effects of trampling, and this species is not grazed. It is unlikely to become threatened, even if grazing pressure increases. 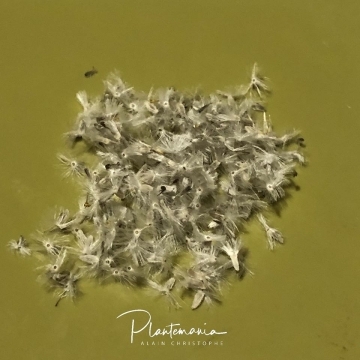 The older mature plants produce little new growth, few flowers and little fertile seed. 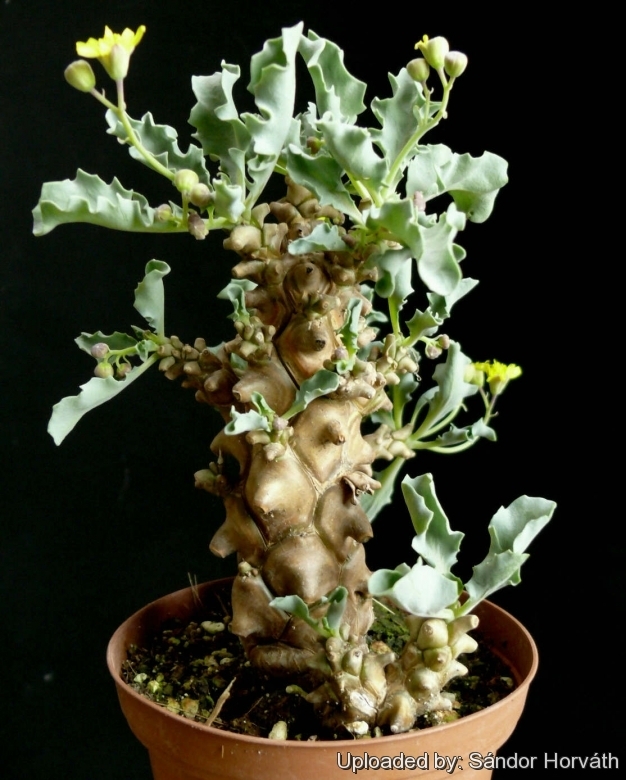 The younger plants produce the most flowers and seed, but flowering is still rather limited in comparison with other othonna species. At some localities the species is found growing together with Othonna retrorsa. 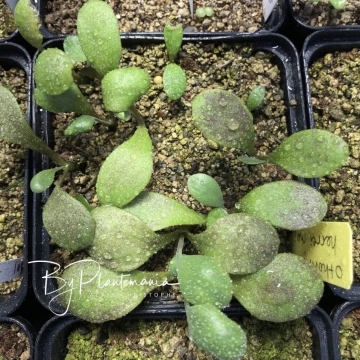 This species is popular in cultivation, and is potentially threatened by collectors removing mature individuals from the wild, for sale in the specialist succulent trade. 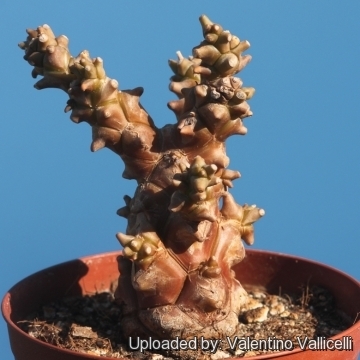 Description: Othonna herrei is a curios a dwarf succulent shrub bonsai subshrubs 10-20(-30) cm tall with few erratic, thick forking, branches covered in knob-like woody tubercles formed from leaf bases, superficially remembering of Cotyledon wallichiana. 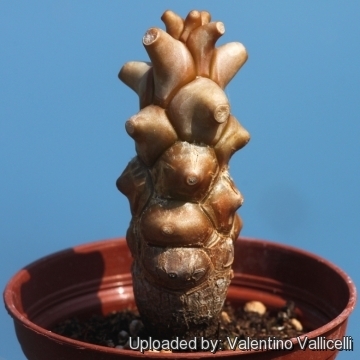 This is one of the most fascinating species, also proving to be one of the most difficult to grow successfully. It is dormant during summer. Leaves are irregularly obovate, undulate, fleshy on short stalk, glaucous green, deciduous. Numerous small yellow flowers are produced in short panicled inflorescences. Stem: Short, thick, caudiciform, branches covered in smooth cork-like, initially yellow, later dark-brown bark, 7-8 cm long about 1.5-3 cm in diameter at the base, bearing the prominent and brown remains of leaves bases as persistent, gnarled or knotted tubercles. In habitat the older plants have heavily blackened trunks in comparison with the brownish gold appearance of the younger plants. Leaves: Deciduous, clustered at stems apex, soft and fleshy, 4-7 cm long, 1.5-3 cm wide, flat, irregularly obovate-spatulate, irregularly dentate to notched and wavy-edged and narrowed at the base towards a distinct short petiole, soft green with a light glaucous waxy coating. After the blade falls the corky leaf base grows into the already mentioned tubercles. Flowers: In terminal, few-flowered panicled inflorescences 5-10 cm long. Flowers (capitula) 3 to 5 tiny, 12-15 mm in diameter, delicate yellow. Phyllaries 6-7. Ray flowers 6-8, broad, yellow. Disc flowers about 20, yellow. Blooming season: Summer, and often later. Chromosome number: 2n = 20. 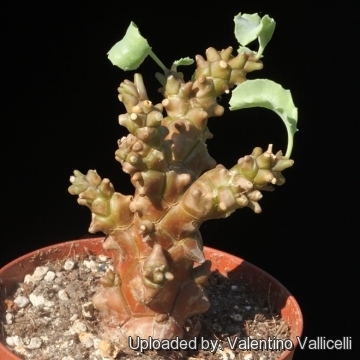 Othonna herrei subs. armiana (van Jaarsv.) Halda: Similar to Othonna herrei, but the plant base, caudiciform, mainly underground with a flattened crown and short knobbly branches. 2) Craib, C. 1997. "Othonna euphorbioides, O. herrei and O. lepidocaulis: Their natural history and propagation." British Cactus and Succulent Journal 15(1):41-47. 3) Raimondo, D., von Staden, L., Foden, W., Victor, J.E., Helme, N.A., Turner, R.C., Kamundi, D.A. and Manyama, P.A. 2009. “Red List of South African Plants”. Strelitzia 25. South African National Biodiversity Institute, Pretoria. 4) Rowley, G.D. 1994. 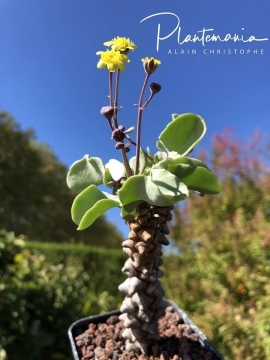 “Succulent Compositae”. Strawberry Press, California. 5) Snijman, D.A. 2013. 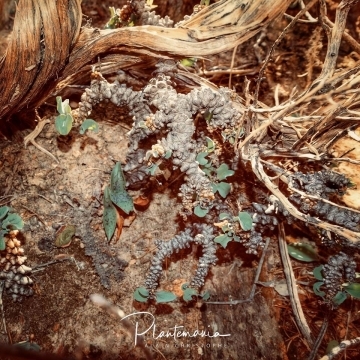 “Plants of the Greater Cape Floristic Region 2: The extra Cape flora”. Strelitzia 30. South African National Biodiversity Institute, Pretoria. to summer. They must be grown very hard in the nursery as close to the natural conditions as possible. This ensures that they keep their compact habit.